In less than one year, Sofia Kenin has gone from champion of the $60,000 Berkeley (Calif.) Challenger to Fed Cup heroine. Kenin, a late replacement for veteran Madison Keys, defeated Timea Bacsinszky, a former top-10 player, 6-3, 7-6 (4) today to give the United States an insurmountable 3-1 lead over Switzerland on an indoor hard court in San Antonio in the Fed Cup World Group playoffs. "I'm speechless," the 36th-ranked Kenin, who trailed by a service break twice in the second set, said in an on-court interview. "It's my first win in Fed Cup, and I'm honestly so happy. You guys (the fans) are incredible -- I love the support. You guys really saved me, so thank you." Kenin, a 20-year-old Moscow native who moved to the United States as a young child, had been 0-3 in the Fed Cup, all in singles. Bacsinszky, 29, reached a career-high No. 9 in May 2016 but underwent surgery on her right (playing) hand in September 2017. Since dropping out of the rankings last September, she has climbed back to No. 111. Earlier today, Fresno product Sloane Stephens beat Victorija Golubic 6-3, 6-2 to give the U.S. a 2-1 lead. In the last match, Switzerland's Ylena In-Albon and Conny Perrin beat Jennifer Brady and Jessica Pegula 7-5, 6-2. Absent this weekend were top-20 singles players Serena Williams of the United States and Belinda Bencic of Switzerland. They have climbed as high as No. 1 and No. 7, respectively. The United States will remain in the elite World Group next year and try to win its 19th Fed Cup title. The Czech Republic ranks second with 10. Switzerland, meanwhile, will stay in World Group II. In a gutsy move, U.S. captain Kathy Rinaldi chose Kenin over Keys to play the critical fourth match. Kenin, who also won Northern California Challenger singles titles in 2016 and 2017, is far less experienced and accomplished than the 24-year-old Keys, who won the last Bank of the West Classic at Stanford and reached the U.S. Open final in 2017 (losing to Stephens), but mentally tougher. Keys, ranked No. 14, lost to No. 80 Golubic 6-2, 6-3 in the opener on Saturday to fall to 4-5 in Fed Cup singles. Stephens, ranked No. 8, then evened the series with a 6-4, 6-3 victory over Bacsinszky. Both Brady and Pegula made their Fed Cup debuts. Brady swept the singles and doubles titles in the $25,000 Redding (Calif.) Challenger in 2014. Pegula reached the singles final of the $50,000 Sacramento Challenger in 2012, losing to Modesto product Maria Sanchez, and advanced to the semifinals of the $60,000 Stockton (Calif.) Challenger last October. Pegula's parents, Terrence and Kim Pegula, own the NFL's Buffalo Bills and NHL's Buffalo Sabres. Sloane Stephens came through under pressure today in the Fed Cup World Group playoffs after a disappointing performance by Madison Keys. Stephens, a Fresno product ranked eighth, defeated Switzerland's Timea Bacsinszky, a former top-10 player ranked 111th, 6-4, 6-3 on an indoor hard court in San Antonio to give the United States a 1-1 tie in the best-of-five-match series. Bacsinszky reached a career-high No. 9 in May 2016 but underwent surgery on her right (playing) hand in September 2017. She lost the first nine matches of her comeback last year and dropped out of the rankings. In today's opener, the 14th-ranked Keys lost to 80th-ranked Victorija Golubic 6-2, 6-3. Keys won the last edition of the Bank of the West Classic at Stanford in 2017. Absent this weekend are 11th-ranked Serena Williams of the United States and 20th-ranked Belinda Bencic of Switzerland. Like Bacsinszky, Bencic cracked the top 10 in 2016 and had surgery (wrist) in 2017. The winner of the series will compete for the Fed Cup championship in the World Group next year. The loser will drop to World Group II and be unable to play for the title. In Sunday's first match, Stephens is scheduled to play Golubic at noon PDT (Tennis Channel), followed by Keys against Bacsinszky and the U.S. doubles team of Sofia Kenin and Jessica Pegula versus Ylena In-Albon and Conny Perrin. Kenin is ranked 104th in doubles (14th in the United States), and Pegula is 151st (22nd in the U.S.). Barring a lineup change, Pegula will make her Fed Cup debut. 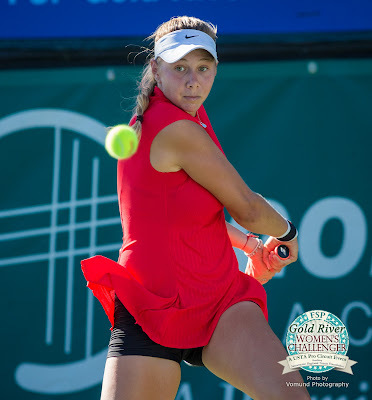 Kenin, 20, won Northern California Challenger singles titles in 2016, 2017 and 2018. Pegula, 25, lost to Modesto product Maria Sanchez in the final of the 2012 Sacramento Challenger and reached the singles semifinals in the Stockton (Calif.) Challenger last October. College women -- No. 4 Stanford, the defending NCAA champion, dominated No. 14 Cal 6-1 in the Big Slam in Berkeley for its 14th consecutive victory and 37th straight in conference regular-season matches. On Court 1, No. 28 Michaela Gordon, a sophomore from Saratoga in the San Francisco Bay Area, beat No. 44 Julia Rosenqvist 5-7, 6-4, 6-0. The Cardinal (19-1 overall and 10-0 in the Pac-12) will be seeded first in the Pac-12 Championships, Thursday through Saturday in Ojai, Calif. The Bears fell to 12-7 and 6-4. Eighth-seeded Peter Polansky of Canada edged Jenson Brooksby, an 18-year-old wild card from Carmichael in the Sacramento area, 6-2, 3-6, 7-6 (6) today to reach the quarterfinals of the Sarasota (Fla.) Open. Polansky, ranked No. 128, had 10 aces and no double faults in the 2-hour, 27-minute battle on Har-Tru (green clay) in 89-degree (31.7 Celsius) heat and 50 percent humidity. Brooksby, last year's USTA boys 18 national champion, had been 0-2 in Challenger main draws before this week. He dispatched American wild card Jared Hiltzik 6-1, 6-2 in the first round and Australian Marc Polmans, the 10th seed and runner-up in the $100,000 Stockton (Calif.) Challenger last October, 6-3, 6-0 in the second round. Polansky, who won the $100,000 Tiburon (Calif.) Challenger in 2013, was severely injured in a three-story fall from his hotel room in Mexico almost exactly 12 years ago. Jenson Brooksby earned the biggest victory of his promising career on Wednesday. The 18-year-old wild card, from Carmichael in the Sacramento area, stunned 10th-seeded Marc Polmans 6-3, 6-0 on Har-Tru in the second round of the $108,320 Sarasota (Fla.) Open. Polmans, instantly recognizable by his legionnaire's cap, reached the final of the $100,000 Stockton (Calif.) Challenger last October. At No. 163, the 21-year-old Australian is by far the highest-ranked player Brooksby has beaten. Brooksby routed top-seeded Dmitry Popko, then ranked No. 351, in the quarterfinals of a $25,000 tournament in Los Angeles in January for his best previous win. Brooksby, ranked No. 636, also surrendered only three games in his first-round victory over American Jared Hiltzik, a 24-year-old wild card and NCAA singles quarterfinalist in 2015 from the University of Illinois. Brooksby, who had been 0-2 in Challenger main draws before this week, is scheduled to play eighth-seeded Peter Polansky, a 30-year-old Canadian ranked No. 128, today for a quarterfinal berth. Polansky, who won the $100,000 Tiburon (Calif.) Challenger in 2013, defeated Brooksby's comrade from the JMG Tennis Academy in Sacramento, Collin Altamirano, 6-1, 6-4 on Tuesday in the second round. Both Brooksby (2018) and Altamirano (2013) won the USTA Boys 18 National Championships in Kalamazoo, Mich., to earn an automatic wild card in the main draw of the U.S. Open. Brooksby lost to Australian veteran John Millman 6-4, 6-2, 6-0 in oppressive humidity in Flushing Meadows, N.Y., in the opening round. Millman went on to stun Roger Federer in the fourth round before losing to eventual champion Novak Djokovic in the quarterfinals. Brooksby plans to enroll at Baylor in Waco, Texas, in the fall or January 2020. In 2017, Amanda Anisimova won her first professional singles title in the $60,000 Sacramento Challenger at 15. On Sunday, the 17-year-old American earned her first WTA singles crown. The sixth-seeded Anisimova, considered a future Grand Slam champion, beat unseeded Astra Sharma of Australia 4-6, 6-4, 6-1 on clay in the Claro Open Colsanitas in Bogota. Sharma, a 23-year-old former Vanderbilt star, led by a service break at 3-2 in the second set. However, Anisimova broke right back with the help of three double faults. "I think this was a pretty big goal because I overcame so many challenges this week," Anisimova, who reached her first WTA singles final last year in Hiroshima (losing to Hsieh Su-wei), told wtatennis.com. "I'm really happy and proud of myself for how I got through them, and winning my first WTA title means so much." Four of Anisimova's five matches, including her last three, went to three sets in Bogota's altitude of 8,660 feet (2,640 meters). Anisimova soared 22 places to a career-high No. 54. She is the youngest player in the top 100, exactly three months younger than Iga Swiatek. The 17-year-old Pole jumped to No. 88 after losing to Polona Hercog of Slovenia in the Lugano final on Sunday. Sharma, who played No. 1 singles and doubles on the Vanderbilt team that lost to Stanford 4-3 in last year's NCAA final, catapulted 36 spots to No. 102 after her first WTA final. Sharma did win a title Sunday, though, as she and compatriot Zoe Hives teamed for their first WTA crown. College -- William Genesen defeated Jack Molloy 3-6, 6-4, 6-4 on Court 2 to give No. 12 Stanford (14-5, 3-3 Pacific-12 Conference) a 4-3 victory over No. 41 Cal (11-10, 3-3) on Saturday in Berkeley. The Cardinal played without its star, 13th-ranked Axel Geller, for the second consecutive match. Stanford did not disclose the reason. Maria Camila Osorio Serrano, a 17-year-old wild card playing in her home country, defeated lucky loser Kristie Ahn, a 26-year-old Stanford graduate, 6-4, 6-7 (6), 6-3 tonight in the second round of the Claro Open Colsanitas on clay in Bogota, Colombia. Osorio Serrano, ranked No. 438, overcame eight double faults in the 2-hour, 24-minute match played at 8,660 feet (2,640 meters). Ahn, ranked No. 205, saved two match points in a victory over top-seeded Jelena Ostapenko, the 2017 French Open champion, on Tuesday. 2-6, 7-6 (5), 7-5 win over Jelena Ostapenko on Tuesday. Kristie Ahn, a 26-year-old Stanford graduate, scored the biggest victory of her career on Tuesday. The lucky loser from Upper Saddle River, N.J., saved two match points in a 2-6 7-6 (5), 7-5 victory over top-seeded Jelena Ostapenko of Latvia in the first round of the Claro Open Colsanitas on clay in Bogota, Colombia. Ahn, ranked No. 205, trailed 3-0 and 4-2 in the second set of her first WTA main-draw match of the year. Ostapenko finished with 26 winners to Ahn's 11 but committed 56 unforced errors and 16 double faults. Ostapenko, who won the 2017 French Open two days after turning 20, has tumbled from a career-high No. 5 in March last year to No. 29. "It was a really tense match," the 5-foot-5 (1.68-meter) Ahn told reporters after the 2-hour, 31-minute battle at 8,660 feet (2,640 meters). "Obviously, playing in altitude is really difficult for both of us, but I was just really happy to come out with the win and fight for every point." Ahn is scheduled to face 17-year-old wild card Maria Camila Osorio Serrano of Colombia today. Osorio Serrano defeated Conny Perrin of Switzerland 6-4, 6-4 on Monday for her first WTA main-draw in. "Obviously, she's an incredible competitor," Ahn said. "The Colombian girls play so well here, they know the courts better than anyone, and having the home crowd behind her ... I think it will be a fun match."